Progress and advancements in the technological spa industry have opened a highway to nearly immediate visual results for the treatment of a majority of common skin ailments.The world-renowned developers of medical-spa technology have made the ultimate customer experience their top-tier priority in developing advanced, more efficient and highly-effective spa treatments. By targeting a variety of consumer needs, scientists and physicians have tailored technological and simple methods for beauty enthusiasts to safely reach their goals. These experts have re-imagined their innovations to be implemented in a spa-friendly environment; boosting accessibility, and proving high efficacy. Photo Rejuvenation as a component feature of state-of-the-art Intense Pulsed Light Technology is the most advanced clinical method of age reversal. Photo Rejuvenation dressed with Radio-Frequency enhances complexion, diminishes the appearance of fine lines & wrinkles, destroys the over-development of pigment causing melanin, and alleviates active or residual acne. Years of research and innovation have made this Alpha-technology the World-Leading method of preventing and reversing visible signs of aging.At Precision Laser, our technicians strictly adhere to a consistent 7-step process during each Photo Rejuvenation treatment. These guidelines ensure the appropriate use of corresponding product, along side of flawless methodology. By controlling these factors, Photo Rejuvenation is highly productive and absolutely unforgettable. Your Photo Rejuvenation package is always preceded by a thorough consultation and meeting with your well-appointed technicians. The procedure is implemented with continuous ailments of luxury, and constant comforting communication with the intense-pulsed-light operator. For safety, you will always be provided with protective eye wear during each of your treatments. It is common to still see glimmering and flashes of therapeutic light through your eye wear, and will not cause any damage to your eyes or surrounding tissues. 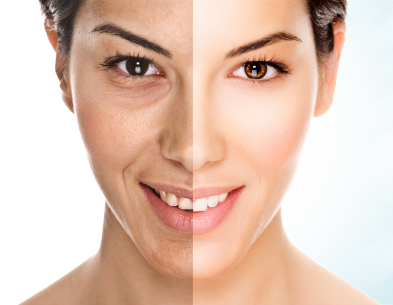 Photo Rejuvenation is entirely non-invasive. With appropriate sun-protection & skin care, you can expect to resume to your regular daily activities immediately following your treatment. In fact, Photo Rejuvenation is so safe, it is also effective in treating alternative areas that may also exemplify visible signs of aging.